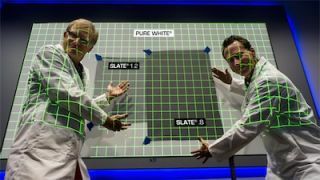 The What: Screen Innovations (SI) Slate is a line of large, black-colored 0.8- and 1.2-gain projection screens. The What Else: Slate delivers stunning images and a fully immersive entertainment experience by rejecting 65 percent of a room’s ambient light, versus a white or gray screen’s rejection of less than 10 percent. The new, black Slate 0.8 gain screen (along with Slate 1.2 gain) features SI’s largest, most versatile ambient-light-rejecting screen technology to date, and is available in sizes of up to a 250 inches (diagonal) in Zero Edge FLEX, Fixed, and Motorized screen formats. The Bottom Line: Slate screens deliver high contrast, clarity, and color reproduction in brightly lit environments.